Pendulum Effect – You can pay 1000 LP; add 1 “Abyss Actor” Pendulum Monster from your Deck to your hand, except “Abyss Actor – Mellow Madonna”, also you cannot Special Summon monsters for the rest of this turn, except “Abyss Actor” Pendulum Monsters (even if this card leaves the field). You can only use this effect of “Abyss Actor – Mellow Madonna” once per turn. Monster Effect – Gains 100 ATK for each “Abyss Script” Spell in your GY. You can only use each of the following effects of “Abyss Actor – Mellow Madonna” once per turn. ● When a Pendulum Monster you control is destroyed by battle: You can Special Summon this card from your hand. ● If an “Abyss Script” Spell Card or effect is activated: You can Special Summon 1 Level 4 or lower “Abyss Actor” Pendulum Monster from your Deck, but return it to the hand during the End Phase. Abyss Actor – Mellow Madonna was a big boost to the Abyss Actor archetype. 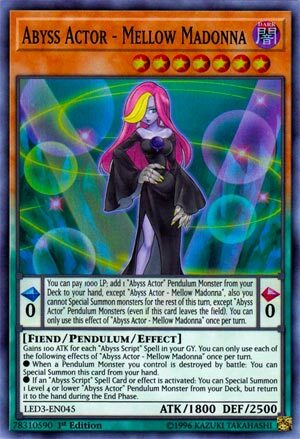 Pendulum monster like all the other Abyss Actors, Madonna as a Spell gives you an Abyss Actor search each turn for a very manageable 1000LP. It’s always good to have a Pendulum Monster in your archetype that can search each turn as a Spell. As a monster, Madonna benefits from each Abyss Script spells in your grave. 1800ATK isn’t much for a Level 7, even if it can be Pendulum Summoned. You’d need eight Abyss Script Spell cards in your grave to boost her to the level of Dark Magician. Special Summon ability off a Pendulum Monster’s destruction in battle eliminates the Level 7 being a problem. The pull from the deck ability of a Level 4 or lower Abyss Actor once per turn when you play an Abyss Script gives you even more monsters to Xyz or Link Summon with at the end of the turn (as that monster you pulled from the deck returns to the hand). The added bonus that you won’t lose the Pendulum you Special Summon from the deck with Mellow Madonna’s effect thins the deck and adds a resource to your hand. There is only one Quick-Play Abyss Script Spell card, so the likelihood that you’ll Special Summon the Level 4 or lower during the Battle Phase for extra damage is unlikely. TLDR….lol Abyss Actor – Mellow Madonna is a Level 7 Dark Fiend-type Pendulum Monster with 1800 Atk and 2500 Def and Scales of 0. Atk is low but who cares. In Pendulum Zone, you pay 1000 to search any other Abyss Actor from your deck once per turn. LP cost searching once per turn is perfect for every archetype, so we’re already doing well. In Monster Zone, she gains 100 Atk for each Abyss Script Spell in your grave hopefully making up the terrible 1800 Atk on a Level 7 body. She can also Special Summon herself from your hand once per turn if any Pendulum Monster is destroyed by battle. You’d probably have to crash into something with the same Atk to really take advantage of the effect on your turn. However, it’s a good defensive play with 2500 Def during your opponent’s turn. The other once per turn effect is to Special Summon from the deck any Level 4 or lower Abyss Actor Pendulum Monster after an Abyss Script Spell Card or effect is activated, but the new monster returns to the hand during the End Phase. Mellow Madonna can combo off her own Pendulum Effect to swarm the field before Pendulum Summoning, but your locked into Abyss Actor Pendulum Monsters for the rest of the turn. It might be enough to win. She has excellent potential in all zones and modes of play and should probably be run in triplicate. Happy Friday! Since there are really five Boss Monsters in the set, I thought I’d end the week off with one and since this card feels the least like a Boss Monster, we will end the week with it, Abyss Actor – Mellow Madonna. Mellow Madonna in the Pendulum Scale is a Scale 0, which is an amazing Low Scale number to have to Pendulum Summon as low as Level 1 Monsters. You can pay 1000 LP to add one Abyss Actor Pendulum Monster from your deck to your hand excluding another Mellow Madonna, but are locked to only Special Summoning Abyss Actor Pendulum Monsters for the rest of that turn, even if Mellow Madonna leaves the field. This effect is also a hard once per turn. You 100% want to get your Special Summoning of non Abyss Actors out of the way first before you summon, so get your Electurmite out on the field soon and anything else you might want. A downside of this is what you might not use what you search right away unless you got all the Special Summoning of non Abyss Actors out of the way before your Pendulum Summon for the turn, or if you haven’t used your Normal Summon for the turn if you search a Level 4 or lower Abyss Actor. Still, having some more search capabilities in Abyss Actors is nice to have. If an Abyss Script Spell is activated, you can Special Summon 1 Level 4 or lower Abyss Actor Pendulum Monster from the deck but send it back to your hand during the End Phase. Nice easy way to get a Level 7 out of the hand outside the Pendulum Summon and getting another monster out of the deck is good, a great target might be Abyss Actor – Wild Hope since it searches upon destruction, even though you’ll bounce it to the hand at the end of the turn, you can just summon it as your Normal Summon or Pendulum Summon it if your scales survive or you have more scales. Mellow Madonna improves the consistency of Abyss Actors, but at the cost of a few restrictions, but is still a great card for the archetype. Art: 4/5 If this is Abyss Actor – Superstar’s wife, I say he did well for himself. Abyss Actor-Mellow Madonna closes our week, who is a Level 7, Dark, Fiend Monster with 1800 attack and 2500 defense (which we’d like switched or better on a Level 7) but a 0 on the Pendulum Scale, which is beyond fantastic. So what does she do…1000 Lifepoints get you an Abyss Actor Pendulum Monster from your Deck to your Hand, present company excluded, of course. You’re prevented from Special Summoning outside the theme requirement here, so only Abyss Actor Pendulum Monsters, even if Madonna leaves the Field. Said effect here can only be used once per turn. She can Special Summon herself from the Hand when a Pendulum Monster of yours is destroyed in Battle. Or she can bring out an Abyss Actor Pendulum Monster from your Deck, that is Level 4 or lower, which is returned to your Hand during the End Phase…and that’s if Abyss Script Magic card is played. She’s very speedy, combo oriented, but wonderful on her own, to a degree as well. The 0 Pendulum Scale is amazing, and even though I knocked her attack and defense at the start, given everything else she does and is capable of doing, it honestly isn’t that big of an issue. Wonderful card and support for a theme. Art; 5/5 This is a spooky szn appropriate picture. Great color as we’ve seen most of the week, very Fiend attributed in the art here. Disco dancing perhaps?